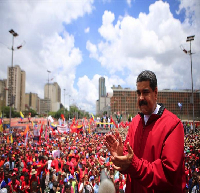 Host Sylvia Richardson speaks to Jorge Marti secretariat of Hands off Venezuela about recent events in Venezuela that can be seen as setting the stage for Coup in the near future. Venezuela has been under attack from the US since a socialist government was first elected in 1998, their was a failed Coup attempt in 2002, Venezuela has seen hard times due to the collapse in oil prices and severe sanctions by the US and EU that have frozen oversees assets. This entry was posted in Uncategorized and tagged be the media, bloggers, borders, capitalism, community, dispatches, Flesh Mapping, global news, Honduras, how to listen, international, internet, interviews, itunes, Jorge Marti, Latin America, latin waves media, media, media democracy, membership, Michael Albert, movements, nother world is possible, participatory economy, passion, Peace, Podcasting, political, politics, radio, Revolution, social change, sound, Stuart Richardson, Sylvia Richardson, Venezuela. Bookmark the permalink.